Thank you for taking the time to communicate to us concerns regarding your installation process. We have every desire to address your concerns and provide the best solution available to bring a resolve. I look forward to speaking with you directly to further address your concerns. Please accept our sincerest apology for any trouble or inconveniences that may have been caused during your experience. 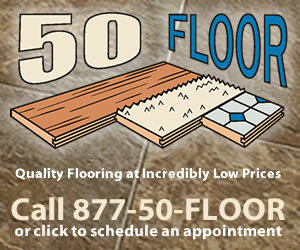 Than you for choosing 50 Floor for your flooring needs. 50 floors, is untruthful and unforthcoming with information. They do not tell you, the ordered product during installation may not be what is ordered. The company is suppose to- vet/ make careful examination of their installers. The installers did not speak English, therefore- we could not communicate with each other. The installation crew were more concerned with getting in and being done, than care or concern of my property. The installation crew left doors crocked and unhinged. The installation crew removed my toilet but upon replacing it, they cracked the connecting hardware which caused water leakage to my new floor- after installation. The installation crew used materials of wrong color (quarter round convex molding). The crew did not finish the job, but now- the typical, other of half expected payment in full. 50floor needs to be more transparent with their capabilities of getting the job done -right. At this point 50floor owes me money- but we the consumer, know how that will go. Whatever happened to people doing right by other? Product or Service Mentioned: Fifty Floor Flooring Installation Estimate. Review #1487863 is a subjective opinion of PaltryGiantPandaBear844.